Castle of the Winds (CW) is a tile-based roguelike computer game for Windows 3.x. It was developed by SaadaSoft and published by Epic MegaGames in 1989. The game is composed of two parts: A Question of Vengeance, released as shareware, and Lifthransir's Bane, sold commercially. A combined license for both parts was also sold. The game differs from most roguelikes in a number of ways. Its interface is mouse-dependent, but supports keyboard shortcuts. Castle of the Winds also allows the player to restore saved games after dying. 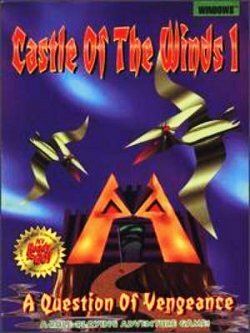 In 1998, the game's author, Rick Saada, decided to distribute the entirety of Castle of the Winds free of charge, but did not release the source code publicly. In 2007, Leptoon began developing a MMORPG style remake of the original game using the source code given to them by Rick Saada. Development was halted in 2007 and resumed in 2012. Development was again halted several months later, but has resumed as of January 2014. Although secondary to its hack and slash gameplay, Castle of the Winds has a plot loosely based on Norse mythology, told with setting changes, unique items, and occasional passages of text. The player begins in a tiny hamlet, near which he used to live. His farm has been destroyed and his godparents killed. After clearing out an abandoned mine, the player finds a scrap of parchment that reveals the death of the player's godparents as having been ordered. The player then returns to the hamlet to find it pillaged, and decides to travel to Bjarnarhaven. Once in Bjarnarhaven, the player explores the levels beneath a nearby fortress, eventually facing Hrungnir, the Hill Giant Lord, the one responsible for ordering the player's godparents death. This reveals a new twist to the plot concerning the player's heritage, and the game continues on as a quest for the player's birthright.